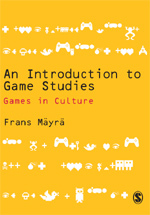 There are few as thorough anthropological studies of games and play as this classic work by Stewart Culin, now available as a two-volume paperback version. Culin, Stewart (1907/1992a) Games of the North American Indians. Vol. 1: Games of Chance. Lincoln and London: Bison Books/University of Nebraska Press. Culin, Stewart (1907/1992b) Games of the North American Indians. Vol. 2: Games of Skill. Lincoln and London: Bison Books/University of Nebraska Press.